Long gone are the days of brands having complete control of the narrative around their products and services. Thanks to the social media revolution, we’ve entered a user-generated content future where consumers are seeking out the opinions of like-minded people to establish whether your brand has the social proof they’re looking for. According to a 2016 study from Twitter and Annalect, approximately 49 percent of social media users rely on recommendations from influencers to inform their purchasing decisions. Consumers have come to trust the opinions of their peers or other online experts far more than brands—and nearly as much as their friends. According to the same study, about 40 percent of respondents said they’ve purchased something after seeing an influencer feature it on his or her social pages. Compare that to the measly one percent of millennials who say a compelling ad has influenced a purchasing decision, and it becomes startlingly clear that you need to build social proof to gain loyal customers—and UGC is at the foundation of that strategy. I like to think of social proof as driving people to replicate the behavior and lifestyles of those they admire—including how they dress, what they eat, and even where they choose to vacation. Social proof is not a concept born in the social media age. For example, in the famous 1986 Hair Club commercial, CEO Sy Sperling drove incredible results with a simple line, “I’m not only the Hair Club president. I’m also a client.” Similarly, nightclubs limit entry and make patrons wait in lines outside. The visual of others wanting to get into the club so badly that they line up increases the perception of the venue’s popularity. Make no mistake—this tactic is meant to entice a passerby to check out the club, too. That said, social media has amplified this effect by delivering intimate snapshots of other people’s lives right into the palms of our hands. Think about it: Social media is the perfect medium for appealing to humans’ inherently tribal side, and this need to belong is critical to the way we share on social platforms. Considering that about a third of all time spent online is dedicated to social media, it’s easy to see the power of social proof. Simply put, social proof shows consumers that their peers are buying a brand’s products, so they should as well. But social proof comes in many forms—all considered UGC—from basic reviews to check-ins to pictures to influencers hyping up events. Here are three tips on how you can establish valuable social proof. Social proof has the ability to drive interest and even loyalty by positioning your brand as trusted and preferred in the eyes of your potential and existing customers. Releasing a stream of high-quality content can place you in a virtuous cycle of follower growth—the more you share, the more people see your content, read it, share it, and follow you. Dunkin’ Donuts, for example, saw Facebook Live as an opportunity to connect and engage with its audience. The first live video gave fans a behind-the-scenes look at its culinary team preparing heart-shaped donuts for the Valentine’s Day Dunkin’ Hearts Love contest. The video garnered thousands of views, comments, and likes in only a few minutes. Social media platforms provide a forum for entertainment, with users attempting to educate, impress, relate to, or entertain their friends. By providing consistently relevant, interesting content, you can increase your follower count and build valuable social proof. 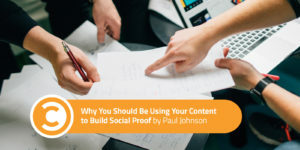 You should release high-quality content about your brand, of course, but if you’re the only one doing so, you’re completely missing the mark of social proof. The goal, after all, is to encourage your audience to leave reviews, share your messaging, invite friends to purchase your products and create their own content about your products. When generating content with the focus of driving shares, think through the lens of, “Would my audience want to share this?” Is the content funny, emotional, or educational? Does it support a cause or belief? If not, get back to the drawing board. A great example is John Lewis, a U.K.-based department store, that created online traction this past holiday season. The creation of an ad featuring a lovable dog, Buster the Boxer, jumping on a new trampoline made for social media gold. Nearly two million people shared the touching video because of its lovable character and message. Incentivize your followers to leave reviews, share your content, and invite friends to purchase your products. The goal should be to increase conversion rates by positioning your brand as well-loved. If you can convince others to trust you because you have evidence that others already do, you can generate a positive perception of your brand. Social proof isn’t all positive, however, and with the ease of sharing comes the difficult task of crisis management. You don’t have to look far to find some recent examples. The negative posts associated with United Airlines and the Fyre Festival spread like, well, fire (pun intended). About half of customers seek out and engage with UGC before making a purchase, but measuring the amount of social proof your brand has and the true impact on the bottom line can be difficult. To get an accurate baseline, make a list of your social proof initiatives and quantities. This means taking the time to measure your current performance on each platform, including the product reviews, social media mentions, social media followers by platform, Yelp and Google reviews, and purchases. After your baseline is set, test growing individual social proof initiatives and measure results. Don’t be afraid to experiment with your platforms. The ultimate goal is to focus on social proof initiatives that drive inbound leads and sales. Look at web traffic, leads, and conversions prior to testing for a baseline, and adjust accordingly. Hypothesize, test, measure, learn, and repeat. And like any other business model, always keep an eye on the competition. Look at competitors, and benchmark against peers in your industry. There are plenty of tools — like TrackMaven and Brandwatch — that allow you to easily keep an eye on the conversations around you and your competitors. Social proof might not be a new concept, but utilizing it to your brand’s advantage can be an incredible opportunity. Follow these steps, and let your brand’s biggest fans do what they do best: advocate. Paul Johnson is the head of operations and co-founder of Lumanu, a marketing platform that helps brands connect with customers through authentic content. Lumanu’s SaaS helps marketers manage microinfluencer campaigns and tap into the power of social proof.